Taking a taxi when traveling somewhere new can be tricky, our article will give you our suggestions on how to avoid taking the wrong taxi and use only trusted brands. Ho Chi Minh City is known for crazy traffic! There are viral videos and photos all over the internet that show the chaotic dance of traffic happening here everyday. Walking across the street in Ho Chi Minh City seems intimidating to some travelers. Never fear the taxi cab is here! As a person who has been living in this city for years, I would recommend using a taxi or the Grab application. This post is a complete guide to traveling with taxis happily and safely in Ho Chi Minh City. I’ve crafted all you need to know about what brands to use and how to contact them. 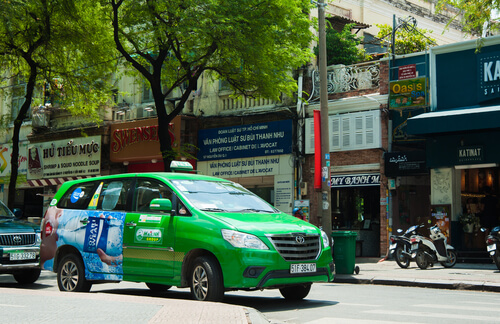 What Taxi Brand should I ride with in Ho Chi Minh City? 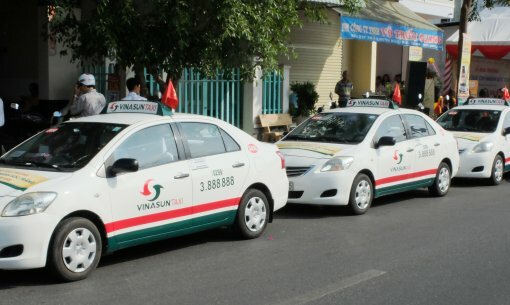 When visiting Ho Chi Minh City, you should only ride in Mai Linh and Vinasun Taxi Cabs. They are the oldest and most trustworthy brands in Vietnam. If you are still nervous about riding a taxi cab there are alternatives digital brands for you to choose. Go with Grab or Goviet. These are popular brands here that are used daily. Here are my useful tips for you to recognize these brands, how to book a taxi, how to reach customer service, and what to do if you lost something in your taxi. I’ll also guide you how to get a proper and trustworthy taxi when you first land in the airport. This taxi is hard to miss, it’s a distinct green color. The green color represents pure environment and brings some sense of comfort. This brand is familiar to not only local people but also many tourists as this brand can be found all over Vietnam. 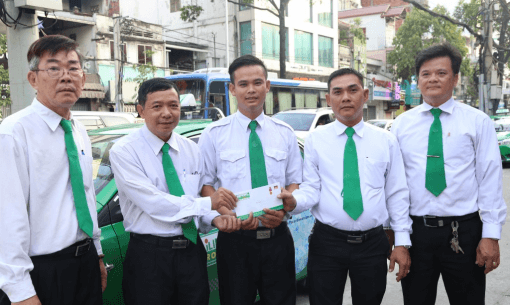 Drivers of Mai Linh wear a white shirt, black trousers, and a green tie. These uniforms are really recognizable because of the green tie. If the taxi driver isn’t wearing this uniform, I would be suspicious and wait for a different cab. Below we have listed all of the contact information for Mai Linh. It’s a good idea to keep their customer service number on your phone just in case you want to call them because of issues. The operators speak limited English. We recommend asking for the help of your hotel concierge or a friendly local if you need to call for a taxi. Mai Linh does have an application but unfortunately there are too many errors making it not very useful. We recommend just grabbing a cab on the street or booking through the phone. This is probably the most popular taxi cab in Vietnam. Their car is bare white with green and red lines connecting the wheels. The logo is a circle formed by red and green arrows, which reminds me of yin and yang symbol. 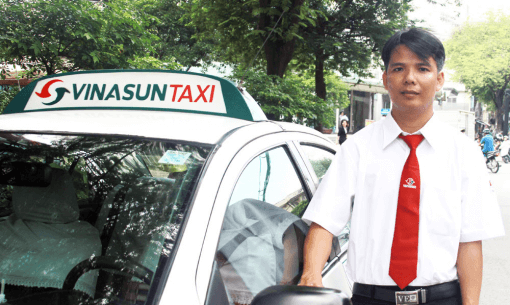 Similar to Mai Linh, the Vinasun taxi drivers’ uniform are white shirt, black trousers, and red tie. There is also a logo of Vinasun on the tie. This number speaks better English than Mai Linh. If you need to call on your own we recommend reaching out to Vinasun. These taxis are not only available in Ho Chi Minh City but also all cities in Vietnam. If you want to travel in Danang, Hanoi, or Hue City, remember the phone numbers and do those same steps. I may not have to tell you much about these brands. Grab is now the cheapest mode of transportation in Vietnam. Just download the app, install it on your phone. Then whenever you want a ride, open it and pick your means of transportation. You can choose your transportation between motorbike and car. 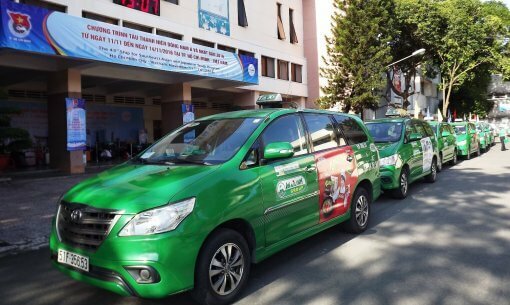 Older articles may say that Grab and Uber are two digital taxi brands in Vietnam, but you should take note that Uber has been shut down in this country since 2018. Moving into take the place of Uber, Goviet has become a popular ride app in Vietnam. Go Viet only has motorbikes at the moment, so if you have luggage, then stick to Grab. There are two airports you can come in at in Ho Chi minh City. Getting a taxi from either airport is going to be very similar but a little bit different. We are going to direct you to make your way towards the “Taxi Queue”. At both airports you are going to need to make your way past the scammers and fake taxi’s looking to rip you off. These guys are gonna use the word “friend” alot and “looking for taxi”. Be strong but nice, and just keep moving away from them to find the queue. At the international airport the queue should be across the little street when you exit from the terminals ground floor. The domestic airport you should make a left after exiting the terminal. We only recommend two taxi services which we discuss in detail below. You are going to be looking for the representatives of these taxi companies so that you can get them to put you into the correct cab. The company’s colors is what you will be looking for to recognize their representative along with the brand logo. It takes around 30-40 minutes driving from Tan Son Nhat Airport to District 1, and even longer in rush hour. The cost for a taxi driving from Tan Son Nhat Airport to District 1 is around 100,000 VND to 200,000 VND (about 4.5 to 8.5 USD). Before leaving the airport, be sure to exchange some money as in Vietnam we only use our local currency. Walking in Ho Chi Minh City is not popular, as the sidewalk infrastructure here is a mess. It can be an intimidating experience when you try to walk in this city. No worries, the taxis are here to help you get around. Hail a taxi using our tips so that you travel safely in Ho Chi Minh City. Lucky for everyone, there are usually taxi’s everywhere in Ho Chi Minh City. Specifically talking about the two brands we have mentioned above. It won’t take long to get a taxi if you stand on the street waving one down for a ride. The exception to this rule is during rain and rush hour. When hailing a taxi at these times, you can expect to wait if you don’t get lucky in the first few minutes. Raise your hand to get the taxi driver’s attention. While they may understand your signal, you don’t have to yell “Taxi!” or whistle like in Western culture. If you can whistle loudly, I recommend you do that because you will just look cool. When the taxi driver arrives, the next step is just telling them your destination. Though drivers these days are trained to speak English, there are still elderly drivers who don’t. Thus, you’ll need to carry a phone with you to show them the address, or write down the address on a piece of paper. A screenshot of the location is also very helpful. What do you do when lost your wallet/luggage/phone on the taxi? First, contact the taxi customer service immediately and report what you’ve lost. Before calling, you should make sure that you can provide as much information as possible, including the taxi identification number, driver’s name, departure and arrival points, total fare, and the route that was taken. If you forget your phone, you shouldn’t call your number. In case there are some drivers or passengers who may want to keep it for themselves. Instead, allow the operator to find the taxi you’ve taken and have it sent back to the office. To conclude, traveling via taxis in Vietnam is easy. Follow these instructions, you have the best chance to enjoy your trip without being a victim of any fake taxis or scams. Just like in life, nothing is a guarantee but we believe that this advice will help every traveler in Vietnam.